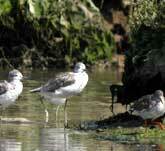 Greenshanks are a familiar sight to most birdwatchers, but where is the best place to find them? There have been few ring-recoveries of Greenshank to or from the UK. The majority (73%) of recoveries are from birds ringed in August and September during autumn migration. Most of these are caught on the south coast of England, so the data is biased towards this area. There are very few recoveries of Greenshank ringed in winter or on the breeding grounds. Of the ringed Greenshank reported dead, 91% were deliberately taken by humans (Migration Atlas 2002). The UK distribution maps for Greenshanks below are based on data from the Wetlands Bird Survey 2000-01, showing sites with mean peak counts of over 9 birds (used as the WeBs threshold) and those sites with over 50 greenshanks on passage in 2000. Please Note: All the above documents require Adobe Acrobat Reader to view them, you can download this free software here.